Process Media - Find your best fit! 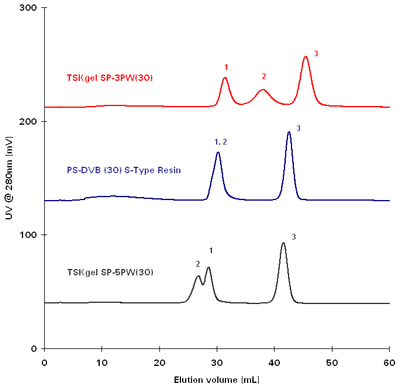 TSKgel SP-3PW is a strong cation exchange resin for biomolecule purification. It is composed of highly cross-linked polymethacrylate beads that have been functionalized with sulfopropyl (SP) strong cation exchange groups. TSKgel SP-3PW resins are best used for high resolution process polishing steps for peptide purifications such as insulin. TSKgel SP-3PW resin is available in 30 µm particle sizes, and has a smaller pore size (25 nm) than the TSKgel SP-5PW (100 nm).